Art on stamps. Always a tricky business. It sounds so great, and easy! Just bang a pic of a beautiful painting on a stamp and you have a beautiful stamp. I think it's fair to say that it hardly ever works like that. Paintings are usually huge and meant to be seen huge, not reduced to some minuscule-size image. But there is an exception. Well, there always is, isn't there?! If a work of art can be reproduced, or sufficiently adapted, it might work well on a small format. The most obvious of these would of course be the reproduction of engravings. Now I don't mind saying that I'm a bit of a traditionalist, so my favourite painter of all time is without doubt Rembrandt. 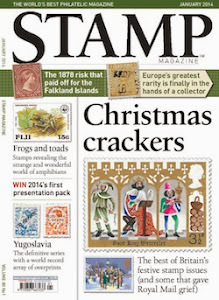 I've often thought about starting a 'Rembrandt on Stamps' collection, but have never done so, for reasons stated above. But luckily for me, Rembrandt made many engravings and stamp designers have happily made use of these, and with good results! 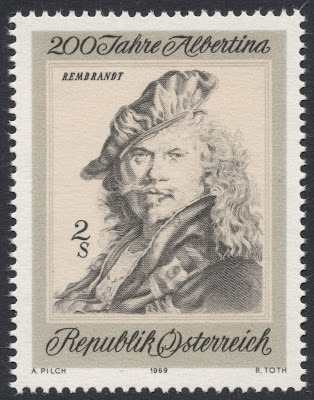 Though these worked well, the actual engraved and recess-printed stamps depicting Rembtrandt's work are even better. Austria issued a set in 1969, to mark the Bicentenary of the Albertina Art Collection in Vienna. 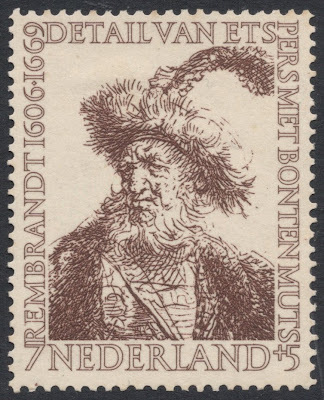 The set of eight stamps includes a self-portrait by Rembrandt. I was in the Scottish National Gallery in Edinburgh the other day, admiring another Rembrandt self-portrait, and there it was stated that no other artist has made as many self-portraits as Rembrandt! We therefore have a great visual legacy of the many seismic changes (ranging from luxurious wealth to depraved poverty) of the painter's life. 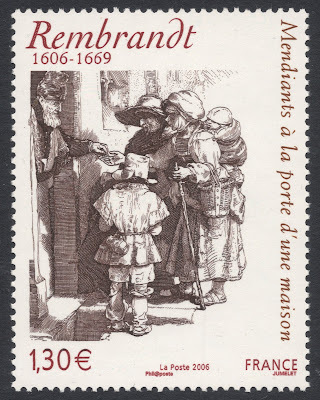 France, too, issued a beautifully engraved stamp celebrating Rembrandt's work, in 2006. 2006 was the year in which the 400th birth anniversary of the painter was marked, and this is, in my opinion, one of the most outstanding of the many Rembrandt issues in that year. Having just said everything I've said on art on stamps, I must admit that my favourite Rembrandt stamp isn't an engraved version of an engraving. It's a reproduction of a painting of Rembrandt's son Titus. 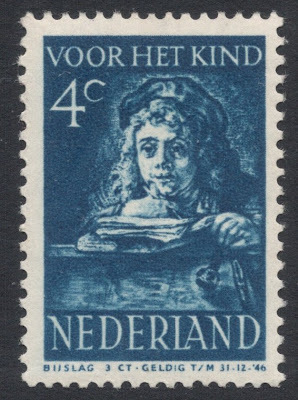 The Dutch stamp is part of set of five identical stamps in different values and colours, issued in 1941 as part of the annual Child Welfare set. But it's not just a reproduction. The painting has been adapted to form an original stamp design, rather than just a pic of a painting. So it works. Wonderfully well! PS: Why not prove me wrong and convince me that art on stamps does work? You can do that on this forum thread! I've since had a discussion with a Dutch printing expert and he tells me that these Rembrandt stamps are actually produced using some sort of combination of photogravure and recess-printing. The name for this particular process may best be described as 'screened recess'. That's a great page you've made indeed! Thanks for bringing it to our attention!